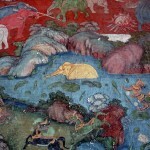 by Talen on September 3, 2009 in Bangkok, Thailand Attractions, Thailand History, Thailand Pictures, buddhism 7 Comments - Leave a comment! As I said in an earlier post on Bangkok’s Giant Swing I had very little time in Bangkok last trip and many things to see. My first trip to Wat Suthat was cut short due to torrential downpours but I eventually found some time a few days later to revisit the Wat. Little did I know at the time the rich history of this particular Buddhist temple I just knew it was beautiful and I really wanted to see it. Unfortunately the weather and my camera’s memory card didn’t hold up well this day so a return trip is in order. Wat Suthat is over 200 years old and considered to be one the most important Buddhist temples in Thailand. 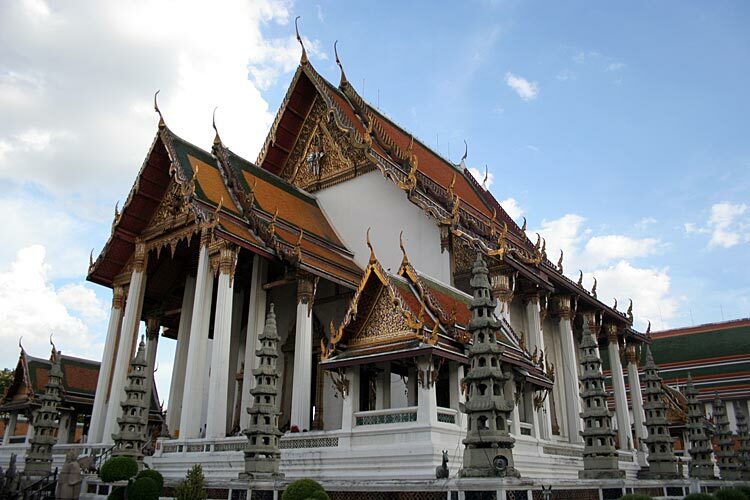 The building of Wat Suthat began in the early 19th century under King Rama I and took over 30 years to complete. It is home to many beautiful Thai/Chinese bronze sculptures including one Buddha statue from the SukhoThai period that dates to over 600 years old and is 25 meters tall. This statue was floated down river over 200 years ago to become part of the temple. Wat Suthat is also home to the ashes of King Anand Mahidol who was the brother of Thailand’s current King. There has been ongoing restoration of the temple in past years including a joint Thai/German project to restore the wall murals and in 1999 the temple commissioned a western Mahayana Buddhist painter, Brian Barry, to design and paint the platform door paintings in the preaching hall. A first as no other time has a non Thai person been allowed to do work on a royal Thai temple. One of the largest draws to Wat Suthst is it’s connection to Mahayana Buddhism and the Phra Kring, a Buddhist amulet that looks like a Mahayana Buddha and makes a ringing sound when shaken. The Thai people believe that this particular amulet has the power to affect ones health. These amulets can be bought at the temple and are very prized possessions by those who purchase them. Wat Suthat is a working temple and you will see many monks as you stroll through the compound. If you have the chance to see Wat Suthat later in the day, around 6 pm, then you will be witness to a large gathering of monks coming to the preaching hall for their daily chants. Wat Suthat is steeped in rich history and Buddhist lore and is easily one of the most beautiful temples in Thailand. 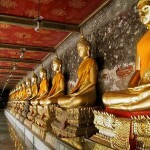 If you are heading for Bangkok then this is indeed one place that should be on your list to visit. I know I’ll be making a return visit. 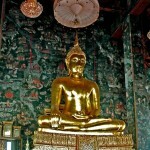 More pictures can be seen of Wat Suthat and the Giant swing in the Gallery Wat Suthat. 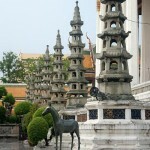 The below video is a short look at Wat Suthat. Talen I’m hardly surprised your memory card went on you because the beautiful photo at the top must of had it wondering if it could repeat such a shot. You really have done Wat Suthat proud with your Giant Swing post and now this one, your research once again is a joy to read and an interesting history lesson in itself. I know in the past you have written about Thai ingenuity but the feat of getting a 25 metre statue down a river 200 years ago is amazing, I wouldn’t be able to do it myself nowadays. You deserve a giant Thai pat on the back because anyone reading the two stories cannot possibly leave your blog without their interest in Wat Suthat and the Giant Swing having been well and truly pricked. A very interesting post. Thanks for the kind words Martyn. The pictures that did turn out I had to crop and play with a little. It was so disappointing to realize that night I had lost close to 300 pictures from the day and I was leaving the next morning for Pattaya. I had seen a picture similar to the top picture of the post on the internet the night before and I tried to re-create it. I did ok but the picture I saw originally had the most amazing sky and a slight fish eye look that really set it off. My best pictures are usually accidents lol. Next trip a return visit is in order for sure. The Main Buddha statue even though as large as it is, is eclipsed by the sheer size of the hall it is in. Amazing sight. I know I would have sank anything over 2 meters tall trying to get it down river so I can’t fathom how they moved this huge statue 200 years ago. Talen, great pictures despite the problems. When I read some of your posts it just makes me realise how little I have really seen of Thailand (I considered myself well travelled)! A week or so in Bangkok will have you see a lot of cool stuff but still leave a lot to see. I still have a long list of things to see in and around Bangkok and an even bigger list of festivals and sights to see around Thailand…I’m hoping it will take a lifetime. I agree, the top photo is beautiful. I can only wonder what the day must have been like! Ouch. I’ve had camera problems before and it hurts. I lost photos of my son’s 97 year old great grandfather sitting on his porch in his rocking chair. The were the last photos taken of him before he went into the hospital to die. Photos such as those cannot be replaced. Cat, the day was beautiful for about 2 hours then it turned into massive rains. Unfortunately I have not made it to the Ancient City yet but that will be my second stop when I return…the first being Bangkok and hopefully lunch with you! Talen, ‘beautiful for about 2 hours’… that’s the season we are now in. I didn’t get rain today (lucky), but it looks like it’s going to dump down in about 15 min. Btw – when you go to the Ancient City, be sure to take a Thai with you to read the different descriptions outside the various rooms. Until this trip, I was not aware that the Chinese Thai use green lamps to signify tea rooms as well as prostitute houses.